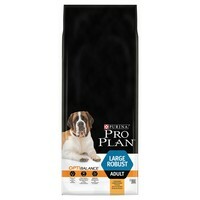 Purina Pro Plan OptiBalance Large Robust Adult Dog Food has been specially formulated for large breed dogs with a robust physique such as Golden Retrievers, Rottweilers, Leonbergers or St. Bernards. With a combination of specifically selected nutrients at appropriate levels for dogs of different sizes and physiques, this complete dry food supports their specific needs and helps to keep them in good condition. Purina OptiBalance also aids with dental care and joints for an active lifestyle.